Collaborative Research: Nitrogren Partitioning and Evolution of Particulate Organic Nitrogen in Peat Fire Emissions. Distribution of peatlands across the world with important deposits in Southeast Asia, Siberia, northern Europe, Canada, and Alaska. 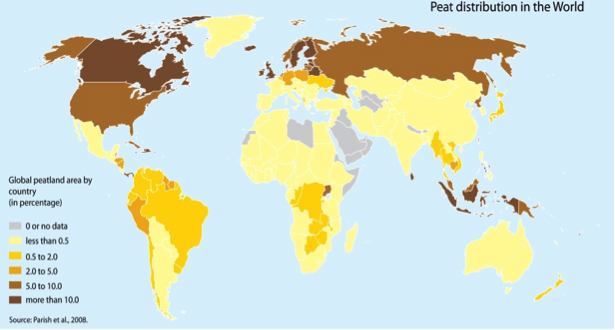 Globally, peatlands store as much as 610 petagrams of C (1 petagram = 1 gigatonne = 1015 grams), representing 20 – 30% of the planet’s terrestrial organic C mass (Page et al., 2011). Overview: This project aims to provide an insight into the partitioning and evolution of nitrogen (N) containing compounds emitted from combustion of peat soils (also referred to as organic soils). The two main objectives are: 1) to evaluate the partitioning of peat soil N into gasand particle-phase components as a function of peat fuel type and combustion efficiency, with a particular focus on quantifying the particulate organic nitrogen (PON) fraction; and 2) to assess how the oxidation (aging) of smoke by hydroxyl (OH) radicals alters the abundance and chemical properties of the PON. It is hypothesized that PON accounts for a significant fraction of peat fuel N due to smoldering-dominated combustion and that this fraction increases further with smoke aging in the atmosphere. Peat soils representative of tropical, sub-tropical, boreal/temperate biomes will be collected, conditioned, and burned in a laboratory combustion chamber at the Desert Research Institute, Reno, NV. Aging of the peat fire smoke will be achieved using a potential aerosol mass (PAM) flow reactor. A comprehensive suite of online and offline measurements will be performed to quantify speciated N emissions, their partitioning, and changes to PON fraction and its molecular composition as a function of aging. The proposed work will contribute to a thorough understanding of the importance of peat fires to atmospheric chemistry, global N cycle, and terrestrial ecosystems. Intellectual Merit: Nitrogen plays an important role in atmospheric chemistry, climate, and terrestrial ecosystems. Major sources of N to the atmosphere are fossil fuel combustion and soil microbial processes. While biomass burning is considered as an important source of carbon (mainly in the form of carbon dioxide and carbon monoxide) and particulate matter to the atmosphere, its role in the global N cycling is relatively uncertain, partly due to an unknown and variable partitioning between gas- and particle-phase N compounds. N emissions from fires in peat soils, a major reservoir of terrestrial C and N mass, are studied very little. Preliminary estimation suggests that N emissions from fires in peatlands can potentially rival fossil fuel combustion. Moreover, a significant fraction of N released during peat fires is expected to be in the reduced form, potentially affecting ozone and secondary organic aerosol formation in smoke plumes. Thus, an accurate assessment of the global N cycling requires a detailed understanding of the various N-containing compounds emitted during peat fires and the factors affecting their partitioning and evolution.